Phyllis Olwande, dancer, Choreographer and story teller. Fierce, beautiful, commanding, strong and graceful were the words that popped into mind when I saw Phyllis on stage. Stuck in my own years of being conditioned into what dance should be able to do or even look like. I spent the first few minutes of Phyllis´ performance trying to put her into a box. But she was moving in her own terms and I must admit, she slowly took hold of me. I was captivated. I realised that it did not matter if I understood the story she was conveying, what mattered was that she demanded my attention. This is what a dancer is able to do, captivate you in her story telling. Who is Phyllis? PA: Performing artist, dancer and choreographer. I also have a degree in Anthropology, which is quite useful to my art. PA: I am the daughter of a Kenyan father and Danish mother, and was born and raised in Copenhagen with strong ties to my Kenyan family. MBP: Why Spain and not Denmark? PA: I moved to Spain because I fell in love with flamenco dance at the age of seventeen and I wanted to pursue it, so Spain was the perfect place for that. MBP: What is your dance background? PA: I started dancing when I was four. I mainly did hip-hop, ballet and modern. I started performing professionally at the age of fifteen, but due an injury I had to stop not long thereafter. I took on flamenco as part of my physical rehabilitation and completely fell in love with the style. MBP: Why did you create this piece and what did you hope it would evoke in the audience? PA: Nyar kakan - I contain multitudes is my latest work that premiered in Copenhagen this January. I created the piece as an investigation of self. It came from a need to express myself creatively and physically without being confined to any dance style or form. It felt necessary – it was time. performed it six times during one week, and although the format remained the same, what my body did changed each night due to the energy l felt from the audience and from myself. I hope the audience was able to submerge themselves into the state of just being, and let their bodies respond to what they were seeing and receiving. It can be difficult to do because we are often used to being passively entertained as an audience, and l wanted to provoke that notion. By performing slowly and repeating rhythm patterns, the audience’s bodies have a chance to just receive, instead of the mind controlling what they’re watching. But I’m aware that this isn’t for everyone and my piece might be perceived as boring to those who have trouble letting go of the mind, or letting go of the notion of entertainment. The presence of a female body of colour on stage can be very powerful in itself, partly because we don’t get to experience that very often in Europe. 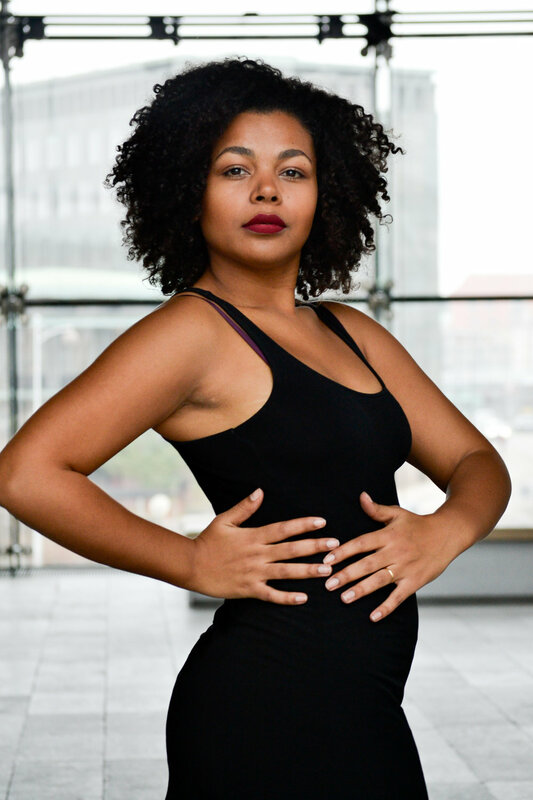 I have had the pleasure of witnessing two very strong performances by female African choreographers and my body had a strong reaction from it – simply because it wasn’t used to being reflected on stage. I treasured that experience with me in coming into my own performance and knew that to minority members of the audience – people of colour – my body on stage might have the same impact on them. So in a way I’m simply passing it forward and showing that we have a right to take up space…and lm claiming mine proudly. MBP: What were the joys, as well as challenges, of the creative process of creating this piece? PA: The joys of creating this piece have definitely been the freedom of being my own boss, and thereby creating a space where there is no right or wrong. I chose to work with my husband, who is a brilliant percussionist, on the piece and he performs the rhythmic foundation in Nyar Kakan. We worked together intensely on the piece for six months, creating everything from scratch, and l would lie if l said it wasn’t challenging at times. However, I knew that for this very personal piece where I’ve had to bear my soul throughout the process, l didn’t want to work with anyone but him. He is a part of my safe space and this process also made us understand each other on a deeper level. The biggest challenge has been to keep going in spite of obstacles – especially financial ones. We didn’t receive any funding, and l sensed a disinterest or lack of understanding of my work from the established art scene and institutions. This, unfortunately, is a reality for most artists, but I do think we need to widen our artistic field in Denmark and let more minority artist take up space – and support that financially! MBP: Define dance for us? They usually say dancers are not eloquent and articulate but I disagree, I believe dance is a language of its own, do you? PA: To me, dance is the communication of the soul. And the more I’m connected in body, mind and spirit, the more honest my expression is and the better I’m able to transmit emotion through movement. I think that language comes in many shapes but we’re often confined to think of language as something verbal, something coming from the mind. But there is language in everything we do. MBP: What are your daily affirmations that you live by? PA: I don’t have any daily affirmations that I live by, but I regularly try to connect with my ancestors, and I often ask my Kenyan grandmother, the strongest person I know who passed away three years ago, to give me strength and let me be present. We are never alone and I find it gives me strength being aware that we stand on the shoulders of those who came before us. In general I try to give myself self-love and self-care. “Checking out” is an important thing to do once in a while to preserve your mental and physical well-being. MBP: What advise can you give specifically to brown children who might think dance is not for them because they lack the representation or role models who look like themselves. PA: The sky is the limit. If you can dream it, you can do it. But it might take a while, and it might take longer than your peers. But never stop believing in yourself! The world is changing and brown and black bodies are more visible in a range of fields and we get to be inspired by others, partly thanks to social media.